This work is a pendant to Landscape with Classical Ruins, Cattle and Figures (RCIN 404376). Both pictures are conscious pastiches of Dutch seventeenth-century paintings. Landscape with Classical Ruins, Cattle and Figures is more of a capriccio than the present painting, with a ruined Classical temple in front of which a shepherd tends his flock and an elderly man reclining on the ground gestures to a woman and her children. Here, people sitting at a table in front of a dilapidated tavern are being served food, watched by two beggars. In the foreground a serving woman is pouring a drink for a rider who has just dismounted from his horse. Zuccarelli’s figures usually wear historical dress, but the seventeenth-century clothes of this man are appropriate to the pastiche. This painting is in the style of Philips Wouwermans (1619–68), whose subject matter included horsemen and travellers outside taverns and whose landscapes are filled with cool, clear northern light and dark clouds. The palette is northern Dutch. The underlayer or ground layer is a cherry red rather than the duller red of Landscape with Classical Ruins, Cattle and Figures. This, with a grey lower layer and a deep blue, give a cooler, northern tone to the painting. The fence in the left foreground, with individualised plants, and the combination of leaf colours in the tree, from green to autumn gold, derive from Dutch paintings; the latter was also taken up by Marco Ricci. Zuccarelli laid in one design, then reworked the whole painting in layers and altered all the figures. 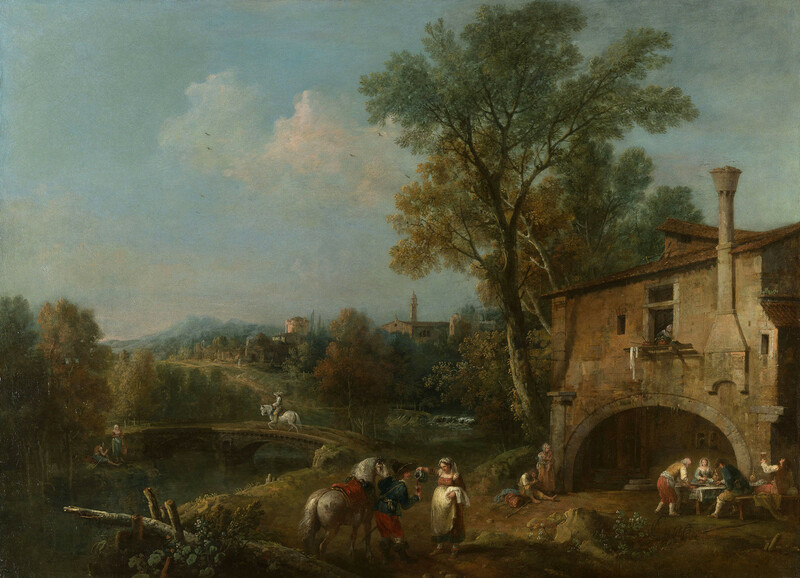 The viewer’s eye is led to the left by the man on the horse crossing the bridge, while the more distant trees in half-light, the track, the buildings and tower in the evening light lead into the nebulous distance.